Kids grow up so quickly. One minute they are in diapers and the next minute your daughter wants highlights! Here's the low down on hair color and your kid. In this article, we will be referring to semi-permanent (4-8 week color) and permanent hair color. Temporary hair colors that wash out immediately or in 1-2 weeks are generally safe for most children, although all safety precautions on the manufacturer's packaging should be used when applying even the most temporary of ​hair color products. Hair color is a chemical. Different brands and types of hair color have different ingredients, but all will contain at least one of the following: ammonia, hydrogen peroxide, isopropyl alcohol, p-Phenylenediamine, and resorcinol. These ingredients are drying to the hair and skin and can cause an allergic reaction. If you choose to use these hair color products on your child, it is important that a patch test is performed to be sure that your child is not allergic to the product. You may have noticed that your child's hair changes a lot. Color, thickness, texture, and curls can go through several changes from birth until puberty. 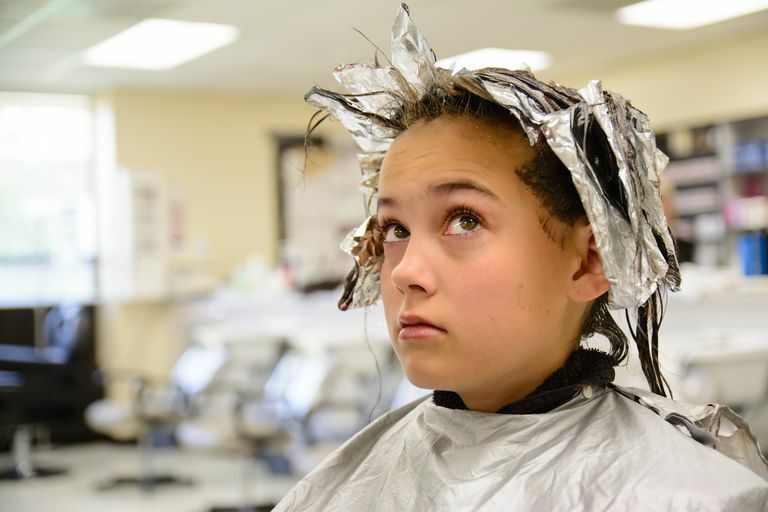 Many recommendations indicate that chemically changing a child's hair prior to puberty age is not ideal. Kid's hair before this time is typically thinner and more fragile and can be easily damaged by even the most gentle hair color formulations. The same holds true for your child's scalp. Children's skin and scalp are more tender, sensitive, and prone to allergic reaction. It's the reason why we use specially formulated shampoo, body wash, and sun protection for our kids. Hair color can be very irritating. In the case of an allergic reaction broken skin, hair loss, hives, itching, and burns can occur. In serious cases, a child could experience difficulty breathing and swallow. It is very important that a patch test is given to any child that is having a hair color treatment. Beyond an allergic or other skin reaction to hair color, some research says that increased risks for cancer can occur from coloring a child's hair at too early of an age. Temporary wash out colors are always fun for kids of all ages, special events, and costume parties. Never apply any kind of semi-permanent or permanent hair color to a child under the age of 8. Gentle (10 volume or less), deposit only, color (which means that you are simply adding color or darkening the color) is okay for kids over the age of 9 or 10. Highlighting or lightening hair (20 or 30 volume hair color) should be reserved for children after puberty. 40 volume hair color should never be used on children. 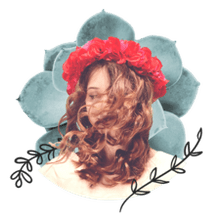 Off the scalp coloring (foiling color or using a highlighting cap rather than allowing the color to touch the scalp) is always better to reduce the chance of allergic reactions. Less is more. Instead of all over highlights or lowlights, try just a few to start!